We have 3 options for those of you that are needing a teeth device to fill the space where the tooth was lost. The lab requires that you have 12 existing teeth on your upper and 12 existing teeth on your lower. 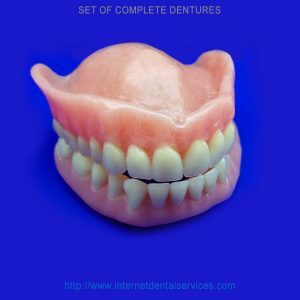 This is a requirement because it is too difficult to get impressions on yourself, from home, when more teeth than this are missing. We do not charge extra for each tooth that we add to these devices. A teeth impression kit is included in the price of each teeth device. Click here to see the complete process. 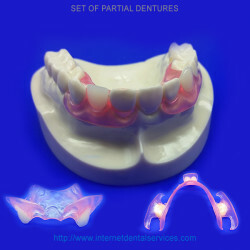 Our best product is our Partial Denture. It is made of a plastic material called Valplast which is virtually unbreakable. This is the only device for teeth replacement, that we offer, that you are able to eat with it in your mouth. This type of Partial will last from 3-5 years depending on the care that is taken. The clasps used, to hold this device in place, are also made of the Valplast material and blends into the color of the tissue and therefore are well hidden. Our Flipper is made of plastic that is durable but is breakable. You will have to take this device out, of your mouth, while you eat. This can last 2-3 years depending on the care that is taken. The clasps used, to hold this device in place, are wire clasps, as shown in the picture, and are visible to others. We have 3 options for those of you that are needing a teeth device to retain the current position of their teeth. We do NOT adjust retainers to align the teeth but our Hawley or Wire Retainer has a wire, that can be manipulated by a dental professional, that can provide minor alignment of your teeth. A teeth impression kit is included in the price of each teeth device. Click here to see the complete process. 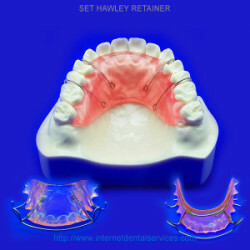 Our best Retainer is our Hawley or Wire Retainer. This retainer is made of Plastic and wire and can last 3-5 years depending on the care that is taken. It is visible to others, due to the wire that goes across the front of the teeth, that holds the teeth in place. The plastic is breakable and must be taken out to eat. We offer a variety of colors for the plastic. Our next best option is our Invisible Retainer. 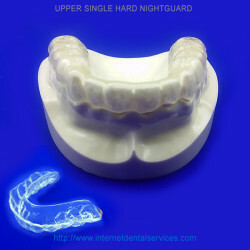 This retainer is made of state-of-the-art Zundura plastic that is the longest lasting clear plastic on the market. Click here to read more about this plastic. This retainer can last up to 2 years which is twice as long as other plastic retainers such as the Essix retainer. 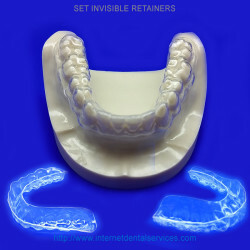 This retainer is virtually non-visible to others. The plastic is tear resistant but you have to take it out while you eat. Our Temporary option is our Instant Retainer. 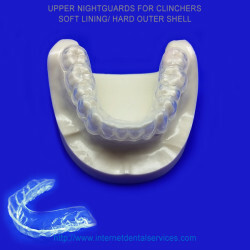 This is a great option, for those whose teeth move out of alignment easily, while you are waiting to receive one of our custom retainers listed above. This is a boil to fit retainer that can be ready to use in minutes. It will only last about a month and is for use while a longer lasting retainer is being made. The plastic is a white color and can be seen by others. We have 2 options for those that grind or clinch their teeth due to stress. These are not for those with TMJ or TMD which are extreme conditions of clinching and grinding. A teeth impression kit is included in the price of each teeth device. Click here to see the complete process. This is for those that grind there teeth, by moving their lower jaw back and forth, and will prevent damage to the enamel of your teeth. This is made of a 2mm hard processed plastic. It has to be taken out while you eat. 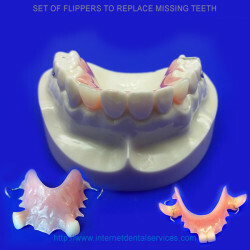 It can also act as a retainer because it encompasses the teeth. This is for those that clinch their teeth by pressing their upper and lower teeth together. 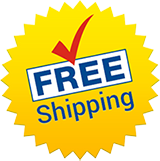 It is made of a plastic that is hard on the outside with a soft inner lining. It has to be taken out when you eat.